In April Susanne Bickel came to talk to us at the Essex Egyptology Group about the work she and her team have been doing in the Valley of the Kings for the last decade - mostly re-excavating previously known tombs with the benefit of modern archaeological methods, but they also discovered a new tomb in 2012. She began her talk by showing us a few images of decoration from inside various Pharaoh's tombs in the Valley of the Kings - our usual "mental image" of the place. But actually only 22 of the known 64 tombs (plus 20 "pits" ) are for Pharaohs. So that means there are around 40 of what are often called non-royal tombs, Bickel prefers to say "other tombs" because the term non-royal is misleading in English. We would say that queens, princes & princesses are also royal, and those are generally the occupants of these non-Pharaoh tombs. Next she talked about why she decided it was worth going back to re-excavate parts of the Valley of the Kings. Some of her colleagues from the University of Basel re-excavated KV47, the tomb of Siptah, which has one of those construction accidents that are sometimes found in the tombs. The original place they were going to build the sarcophagus chamber broke through into KV32, and so the builders extended it down a bit further and started the sarcophagus chamber again. The archaeologists continued to re-excavate into KV32, which contained a lot of debris in the tomb chambers. This included some pieces of artifacts that previous investigations had missed or discarded as not interesting. Some of these fragments have a name on them of Tiaa - the wife of Amenhotep II and mother of Thutmose IV. So there are still interesting things to be discovered even from ransacked, excavated or looted tombs and Bickel decided it was worth having a more modern look at a part of the Valley that had been previously investigated. She and her team have spent about 10 seasons investigating the tombs in the area around KV34, the tomb of Thutmose III. 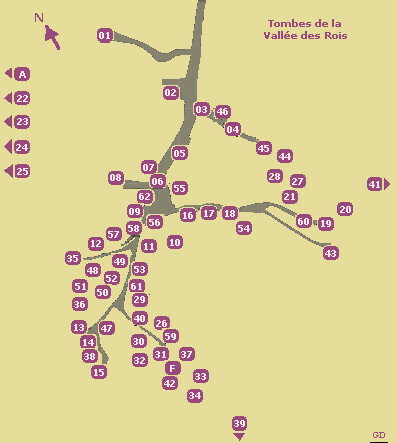 On the map below you can see KV34 down at the bottom in the middle. The questions they were asking through their re-excavation included: what was the chronology of the tombs? who were the tombs for? what was the social & physical identity of the people buried in them? are there patterns in the location & layouts of the tombs? The overall chronology of the area became clear early in their excavations. Their area of the necropolis was originally dug & used in the middle of the 18th Dynasty. All the tombs were before the time of Akhenaten & his move of the capital from Thebes to Akhetaten, and date to the reigns of Thutmose III, Amenhotep II, Thutmose IV and Amenhotep III. As they're using pottery to date the tombs the dates are ranges rather than precise. Although any overall pattern in the layout & location of the tombs is unclear, what is clear is that there are two general types of tombs. There are those with stairs & corridors, where you descend gradually in a series of stages. And there are those with vertical shafts where you go down immediately and the chambers are then in one layer at the bottom. The bulk of Bickel's talk was to be about KV40 & KV64, but first she told us in brief about the other tombs they've re-excavated. KV33 is right next to KV34 and is a step and corridor type of tomb. When previously entered it was dismissed as uninteresting and no real information was recorded, and the entrance was blocked with boulders that may've come from KV34. When they cleared & analysed the contents of the tomb they didn't find anything that gave the name of the occupant. So all they can tell is that they were of high status (there were several fine alabaster jars still in the tomb) and the pottery was from Thutmose III's time. KV37 is situated just below KV34 and is another step & corridor type. There wasn't much left in this tomb, previous archaeologists had removed all the "treasure" and left only pottery fragments mixed in with flood debris. The tomb of KV36 is a the burial of a young Nubian man called Maiherperi, "the Lion of the Battlefield", who was a child of the harem (so brought up with the Pharaoh's children - in Hannah Pethen's talk to the EEG about Gurob she talked more about what the harem was in the Ancient Egyptian context (post)). They are still in the process of excavating KV29 which was in an area covered by Ramesses II's workmen's huts. One interesting find from there is is one of the oldest known sundials marked onto an ostraca. Previously sundials were thought to be a Greek invention, but as this has been found in a secure context dating to the 18th Dynasty it definitely pre-dates the Greek ones. It's pretty accurate once correctly oriented, and was probably used to regulate shifts for the workers. All these tombs (and KV30 too) are undecorated, and in fact this seems to be standard for non-Pharaoh's tombs in the Valley of the Kings. Which is a contrast to the tombs in the Valley of the Nobles which are contemporaneous and well decorated, but similar to the situation in the Middle Kingdom period where similar status people also had undecorated tombs. There's no good answer yet to the question of where the cult for making offerings for these people was. Perhaps in their associated King's temple? Or maybe these are people who didn't live in Thebes so their cult was where they & the people who would make offerings for them lived. Looking at who they can see buried in these tombs there's a sense that the extended family of the king was buried in this necropolis - including wives, children & nurses. During the 18th Dynasty it seems the Valley of the Kings was a more open necropolis with several non-Pharaoh burials, in contrast to the Ramesside period where tombs were more restricted to Pharaohs. In 2009 the area around the entrances to KV40 & KV64 was nearly covered over by sand and debris. It had be a long time since KV40 had been entered, and KV64 was unknown at the time. In 2011 as they were clearing the area near KV40 they discovered a "man made feature" on the very day the revolution started in 2011. As a result they couldn't start to investigate it for another year, which must've been very frustrating! Bickel said that at first they didn't think it would be a tomb because it was so close to the entrance to KV40, but then they found the big blocks covering the opening. Inside the tomb there was a coffin & a stela, dating to the 22nd Dynasty - i.e. ~600 years after the mid-18th Dynasty period that the other tombs she's talked about were used. There was a mummy inside the coffin, stuck in with resin, and the inscriptions said that she was the Chantress of Amun, Nehemesbastet daughter of Nakhet, Opener of the Doors of Heaven. These are (sadly) common names and titles, so it's not possible to place who she is in a historical context. She's definitely of a relatively high social status, although not the highest. Her coffin is of good quality, but nothing terribly exciting or unusual. Her health, according to X-rays, was good when she died so it's not clear what she actually died of. The stela that she was found with was of a common type, but it was the first to be found in situ (by modern archaeologists who recorded where it was placed vis-a-vis the coffin). In the decoration she's worshipping a composite deity - composited from several solar deities & funerary deities. This coffin wasn't on the original floor of the tomb, it was on fill resting on the original 18th Dynasty era floor. The original burial had been looted and completely destroyed at some point before the 22nd Dynasty burial. The skeleton of the original mummy was still there in fragments. There were also some artifacts, including a piece of glass vessel and 2 canopic jar lids. There was also half a tag which named the King's Daughter Sat-Jah - but as the fill may not all be from the original burial it's not clear if that names the fragmented mummy or not. This new tomb, as well as being exciting because it's the first new tomb to be discovered since Tutankhamun's tomb, helps to clarify the picture of how this area of the Valley of the Kings was used over time. In the mid-18th Dynasty the royal family and their entourage were buried in this part of the valley. Then 500 years later in the 21st Dynasty there was a period of authorised looting and "recycling" of materials. All the gold and wood was removed for re-use, and items such as amulets were stripped from the wrappings of the mummies including those of the Pharaohs. The people doing this "recycling" knew which mummy was which, and who these people were. They took care with the bodies of the Pharaohs, re-wrapping them respectfully and putting them into caches where they were discovered in modern times. But they took rather less care with the other bodies, as can be seen from the fragmented skeleton left in KV64. About 100 years after this, in the 22nd Dynasty, the tombs are reused by priestly families - there's clearly still an association of sanctity with the Valley of the Kings so it's an appropriate place to bury reasonably high status individuals. After a break for coffee & cake Bickel told us about what they have found in KV40, which had been known to archaeologists for some time but had been dismissed as uninteresting. Bickel's opinion, however, was that although from the top it just looks like a hole in the ground it's a very interesting hole in the ground! The proximity to KV64 is also interesting - KV64 is a little older and a larger tomb, so perhaps KV40 was dug there so that the occupants were close to the lady buried in KV64? All the rooms of KV40 were covered in debris with pottery, wood, faience, human remains, fabric and more all utterly mixed up. The walls and ceiling were damaged by fire, as were the contents of the rooms. They started by mapping and then sorting out and analysing the material. It's taken them 6 years to analyse, but they are now nearing publication. Bickel described the stages of the archaeological process for us. They started by excavating the objects, and then conserved them. This was followed by documentation (done both on site and after the objects had been removed) and classification of the objects. Everything has then been stored so that it's kept safe for later study. As with KV64 there were at least two phases of use for KV40, at similar periods of time and in similar ways. Then modern looting took place, and at some point there was a fire in the tomb but it's not yet clear when that was. There were a lot of cartonage fragments, all of which needed to be cleaned of soot before they could be conserved. Once cleaned they could be separated into 18th Dynasty and 22nd Dynasty pieces, and some bits could even be fitted together. The fabric pieces were mainly fragments of everyday fabrics, and included a single sock made for a small adult foot (Euro size 35/UK size 3) which was designed to be worn with sandals. Each type of object is being studied by experts in those fields - for instance paleobotanists are analysing the few bits of plants that were present. For an exhibition in Basel one of the botanists planted the relevant plants and made a modern replica of the garlands that there were fragments of - which must've been cool to see! The human remains have been analysed by a paleo-physical anthropologist, and there are parts of 83 individuals in this tomb. Most of them were women, but there were a few men. Unusually there were also some very small babies very carefully mummified - this is rare, generally babies were not buried in this way. Because the bodies are already in pieces they can be used to investigate the mummification techniques that were used. But sadly other interesting sorts of analysis can't be carried out for technical reasons. C14 dating should be possible to find out which bodies were from the original phase of use and which from the later, but the only lab in Egypt that can do this sort of analysis has old technology that needs too large a sample size (and of course artifacts & remains can't be removed from Egypt to a lab that can carry out the analysis). They have also taken samples to analyse the DNA of the remains, but again the only lab in Egypt that can do this work is currently non-functional - the samples are waiting in storage until the situation changes. When this sort of analysis can be done it should be very interesting, given that some of these individuals may be other members of Amenhotep III's family (as discussed below). The type of artifact that Bickel wanted to tell us the most about were the pottery pieces. They laid all the pottery fragments out in the Valley of the Kings near the tomb, and then painstakingly pieced together this enormous jigsaw puzzle. They were able to reconstruct 120 large jars which had contained natron and ritual remains. Several of these jars had inscriptions, too. Often in such cases the inscriptions are a bit boring and just tell you the contents of the jar - but in this case they also included the names of people and their titles. As with the human remains there are more women than men named on the jars - there were 23 female names, and 4 male names. All of the males are King's Sons, and 12 of the females are King's Daughters. It's important to remember that King's Daughter doesn't imply a little girl - it was a title you kept for life - so even though we know that the first phase of use was during Amenhotep III's reign we still don't know whose daughters these women were. However, the names on the jars correlate well with the names labelling reliefs of Amenhotep III's daughters (such as that in TT192, a noble's tomb in el-Assasif). Some of the women were granddaughters of a Pharaoh - for instance "King's Daughter Taemwadjet from among those of the King's Son". Having reminded us that the Daughters & Sons weren't necessarily children Bickel returned to the carefully mummified infants and wondered if these might be the royal sons that are named - one might expect an adult son to be more likely to be high enough status to have his own tomb. This is another question that the DNA analysis will help to answer. One woman is a King's Ornament (which is a title that we're not quite sure of the significance of). Three women were labelled as foreign, and 7 had no titles associated with them. As well as the indicated foreigners other women clearly had foreign names, of Semitic or Nubian origin. Whilst this doesn't mean they were themselves foreign, Bickel speculated that some might be women who came to Egypt with diplomatic wives of Amenhotep III or another Pharaoh. For instance, there's documentary evidence of a Mitanni wife who came with 317 of her women, so there must've been quite a lot of such women. The jars appear to've been used for some ritual purpose. One of the mud seals has shards from a red plate in it that has been ritually smashed and incorporated into the seal. There's textual evidence of a "ritual of the breaking of the red pots", and this is physical evidence of it. Some of the jars have two stages of inscription on them - the first one is covered over by a white coating and then another inscription written on top in yellow (which is a rare colour for writing in Ancient Egypt). In some cases the inscription is the same in both stages, just the second one is in better handwriting than the first. But in other cases the first label says "Natron" plus the name, whereas the second label (in better handwriting again) just says the name. Bickel's proposed sequence of writing & use is that first the jars were quickly labelled with who (and sometimes what) they were for, then they were filled and sealed. Then overpainted and a more formal label written on top with just the name of the owner. In the questions session after the talk Bickel clarified how she sees this first phase of use of KV40 - there's no evidence of it having been a cache of bodies gathered up from other original tombs. Nor is there any evidence for it having been a mass burial after an even such as a plague. But the burials were probably over a relatively short period in the 18th Dynasty before the Amarna period. There are other similar groupings of royal daughters from this period throughout Egypt and Bickel thinks they may be the resting places for women who died away from home while they were travelling with the peripatetic court of the time. This was a fascinating talk, I hadn't really realised there was still so much to be found even in tombs that have been known about for decades, if not centuries. Exciting that they have discovered a new tomb - even if not a Pharaoh, it's another bit of the picture of the Valley. Also quite exciting that they've discovered these bodies that may be more members of Amenhotep III's family.